In PortaBilling®, several devices (for example, laptops, 3G / 4G or WiMAX modems) associated with the same account can share a single Internet quota. Sharing can be done among multiple devices with static and / or dynamic IP addresses. In this handbook we assume that you already have an operating system to provide Internet access service. Please refer to the Broadband Internet Access Services handbook for detailed information about how to configure destinations, nodes, vendors, connections, tariffs and products, if required. 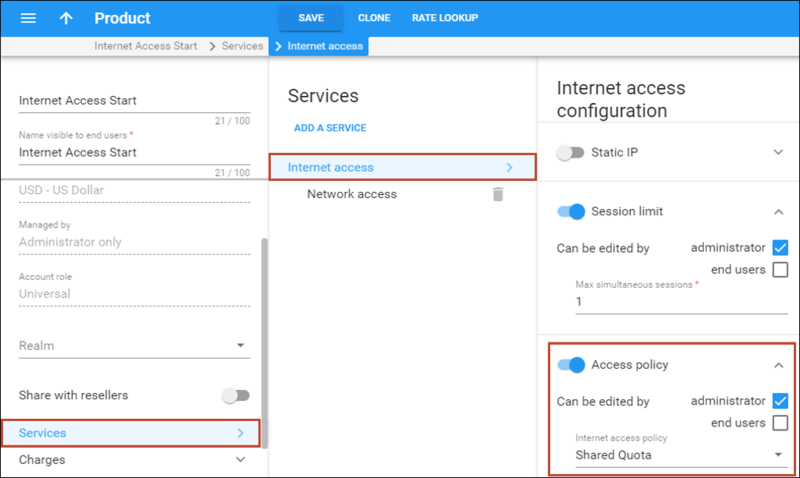 The steps below describe how to supplement the operating configuration for your customers to assign static and / or dynamic IP addresses to multiple devices sharing the same Internet quota. The NetAccessVerifyMAC module checks whether the device’s MAC address is authorized to use the Internet service. The module matches a static IP address with its corresponding device to enable quota sharing. 4. Click the Save button and then the Check button. Configuring an Internet access policy allows PortaBilling® to identify the customer by using the device MAC address. Using the verify_mac module, the billing engine searches for the customer via the MAC address received in the authorization request. Here are directions for what to do when an Internet access policy has not been previously created. However, if the Internet access policy was previously created and assigned to your product, go directly to the step 3. · Name – A short descriptive name for this Service policy. Type in Shared Quota here. · Regular – A regular bandwidth rate that is used most of the time. In our example, the Download Rate is 1 mbps, the Upload Rate is 1 Mbps. · Turbo – This defines a bandwidth rate for off-peak times. In our example, the Download Rate is 10 mbps, the Upload Rate is 10 Mbps. · Limited – This usually restricts the bandwidth to an extremely low value, so that the customer can only access the Internet for checking his bill, making a payment, etc. Let’s specify 512 kbps here for the Download Rate and 120 kbps for the Upload Rate. 5. Configure the access type of usage on the grid that shows all of the week’s hours. Simply click on a cell within the grid to set a certain access type for that particular hour. NOTE: This step is required only when your NAS communicates with PortaBilling via RADIUS. 8. 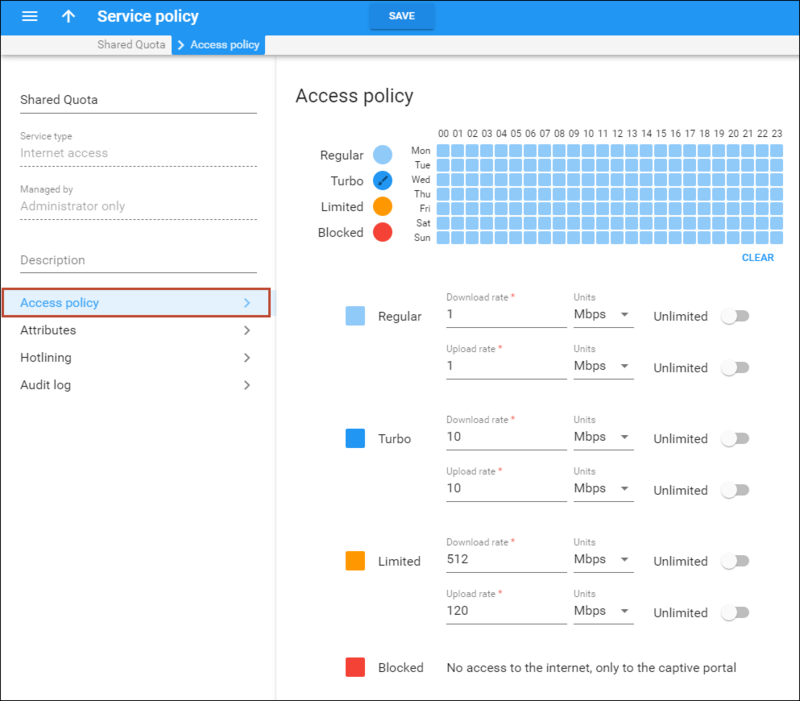 Assign the Shared Quota Internet access policy to the product associated with the Internet service on the Internet access configuration panel. A customer is an account owner of accounts. The customer’s contact information is used to distribute account usage information, internet access statistics, invoices, etc. In real life, this customer is an entity (company, retail customer, etc.) that owns multiple devices. Product assignment, quota tracking and usage charges will be applied to the main account. · ID – The ID that will be used to authorize Internet access. In this example, it is prime. 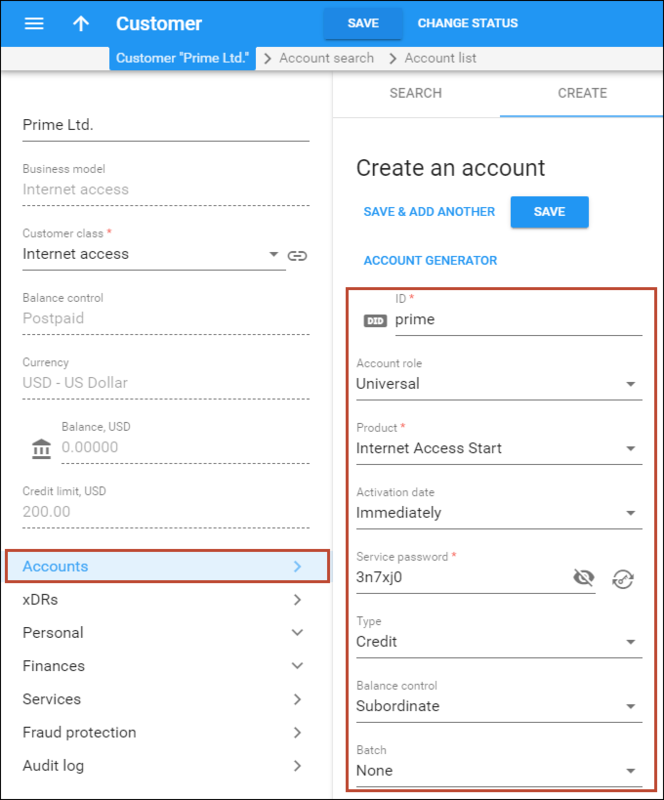 · Product – Select the main product that you want this account to have (e.g. Internet Access Start). NOTE: You may configure multiple main accounts, if needed. Each main account will share an assigned Internet quota among the devices that work in conjunction with it. 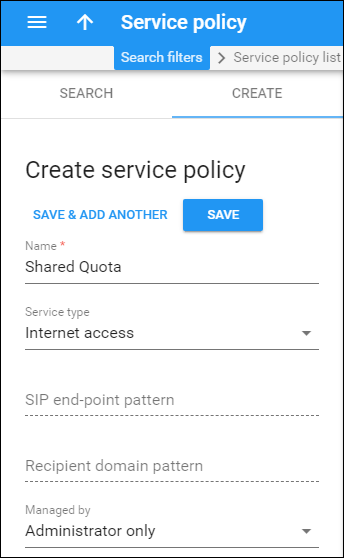 This makes it possible to use several shared Internet quotas under the same Customer. To add devices that have dynamic IP addresses, create aliases on the main account page for each such device in the Account_ID@MAC_Address format (e.g. prime@ 07555111C900). 1. 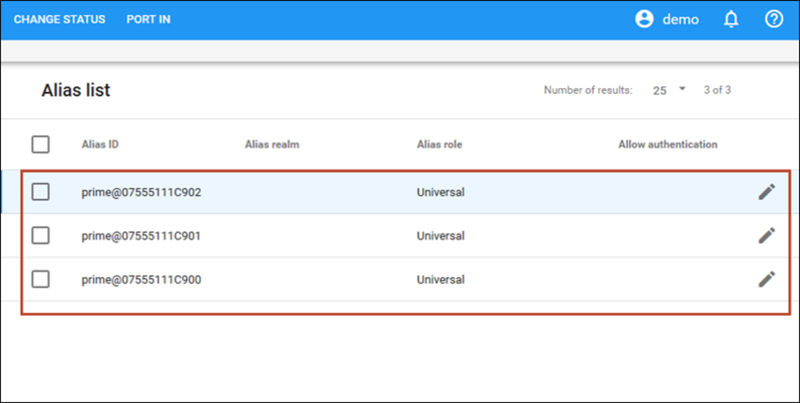 To create an alias, open the Alias create panel on the main account. · Alias ID – Specify the alias in the Account_ID@MAC_Address format. In this example, prime@ 07555111C900. 4. 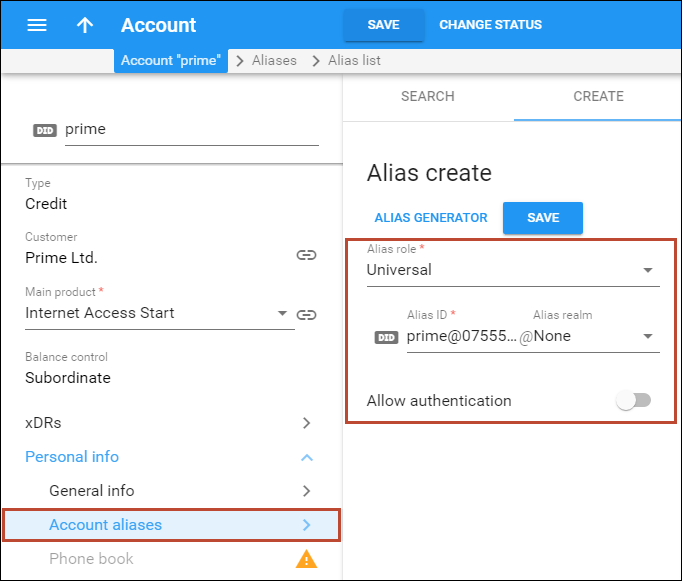 Repeat steps 1-3 to assign aliases for all devices with dynamic IP addresses. 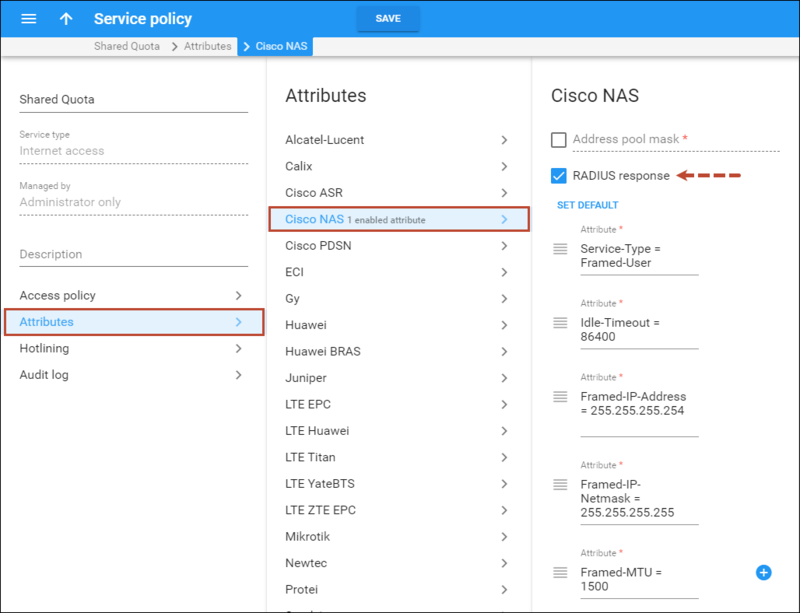 When any of these devices starts a session, PortaBilling® locates its alias and authorizes NAS to assign a dynamic IP address to this device. 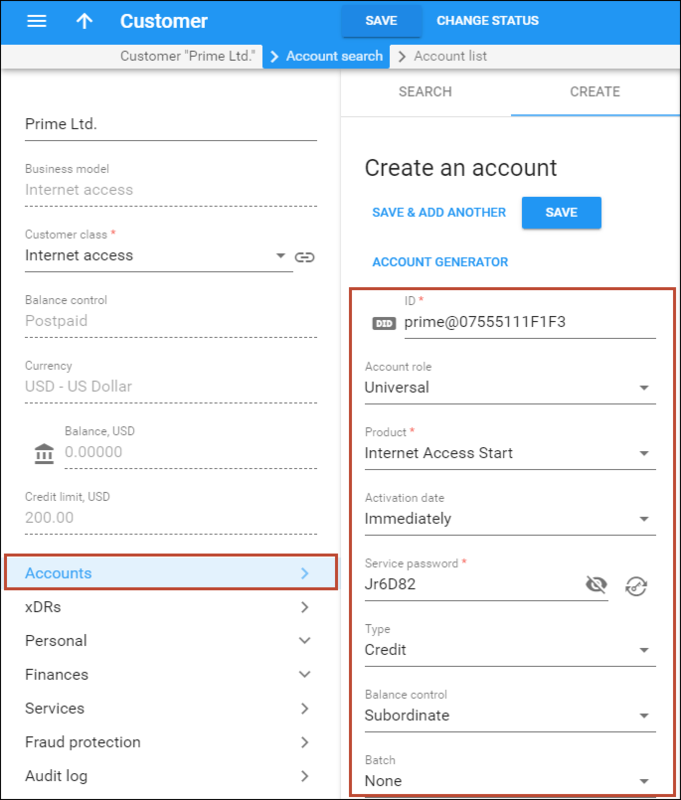 For devices that require a static IP address, create separate ad hoc accounts under the same customer in the Account_ID@MAC_Address format (e.g. prime@07333777F1F1) and configure the static IP address for each ad hoc account. o MAC_address is the MAC address of the device with the static IP address. · Product – Select any product associated with the Internet access service. NOTE: An administrator can assign any product to this account – all existing settings will be ignored by PortaBilling® (and bypassed). These are auxiliary accounts with one single purpose – to supply the main account’s devices with static IP addresses. · Static IP – Select Enabled to enable this functionality. · Static IP – Specify the device’s static IP. · Static IP Netmask – Type in a netmask, or leave the default value: 255.255.255.255. 6. 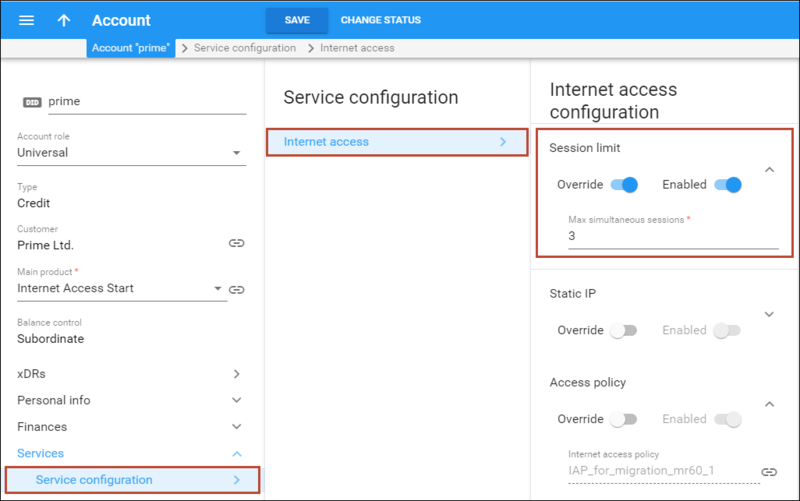 Repeat steps 1–5 for all devices that require the static IP address. When one such device starts a session, it assumes the static IP address from the ad hoc account. When the session ends, PortaBilling® charges the main account.